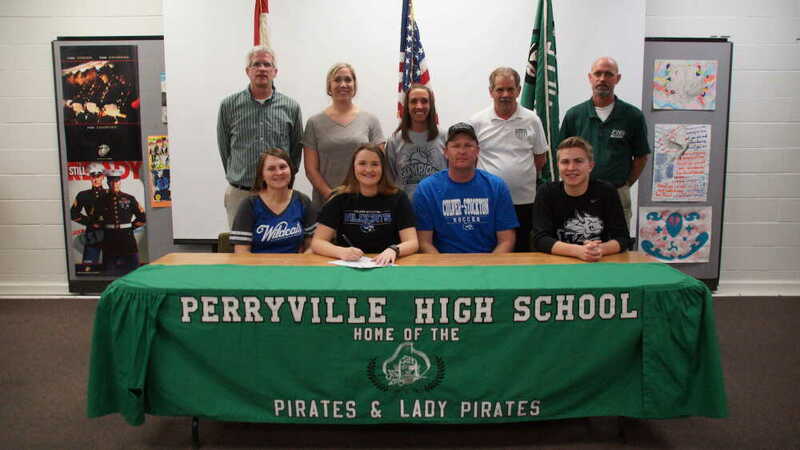 Perryville's Kirstin Jannin, front row center left, signs to play soccer and basketball at Culver-Stockton College (submitted). Perryville senior Kirstin Jannin signed a national letter of intent recently to play women's soccer and basketball at Culver-Stockton College. Jannin was a 2018 All-Southeast Missourian girls soccer team selection and earned Class 2 second-team all-state honors last season, along with all-region, all-conference and all-district accolades. Jannin also has played club soccer with the Southeast Missouri Soccer Club and at St. Louis Scott Gallagher Soccer Club, where she competed in the Elite Club National League and traveled the country for competitions. Jannin was also a member of the Illinois-based 3v3 Lightning soccer team that won the regional 3v3 tournament was runner-up at nationals. Jannin also earned all-conference honors with the Perryville girls basketball team. Culver-Stockton is located in Canton, Missouri, and has NAIA athletics programs. The women's soccer team went 9-9-2 last season and lost to Benedictine College 6-0 in the Heart of America Athletic Conference Tournament quarterfinals. The women's basketball team recently wrapped up a 19-14 campaign that ended with a 67-57 loss to William Penn University in the Heart of America Athletic Conference Tournament championship.